This animation shows the extreme rate of coastal erosion at North Cove, Washington. The red line indicates the shoreline in 1990. Aptly nicknamed Washaway Beach, in Pacific County, Washington, has long suffered from the most extreme coastal erosion along the whole U.S. West Coast. Now a relatively low cost defense is raising hopes among property owners and nearby cranberry growers. The rate of coastal erosion on the north side of the Willapa Bay entrance has averaged an astonishing 100 feet or more per year. Over decades, ocean waves have taken a cannery, a lighthouse, school, Grange hall, post office and innumerable homes and vacation getaways. But this last year much less land eroded. "There are very few areas this winter that took more than about 20-30 feet of loss,” coastal cranberry grower David Cottrell said. He said a pretty mild storm season helped as did an experimental placement of cobbles. "Small rocks that are actually meant to move, rather than static big rocks,” Cottrell said. “These little ones will rattle around in the waves, take the energy out of the waves." David Cottrell stands on an example of ''dynamic revetment'' protecting shoreline from further erosion at Washaway Beach. Cottrell said a combination of donated and drainage district funds paid for placement of the broken basalt rock as "soft armor" on several, short stretches in advance of the last two winters, in some cases intentionally mixed with driftwood. "In the first storms we lost of 5-10 feet in those areas versus 140 feet alongside. That was something that told us we were onto something," Cottrell said. Cottrell and the Pacific Conservation District now hope to win a state grant to add what's technically known as "dynamic revetment" to about one-and-a-half miles of vulnerable coastline. That they think will go a long way to retiring the nickname Washaway Beach and allow the community to be best known by its official name, North Cove. 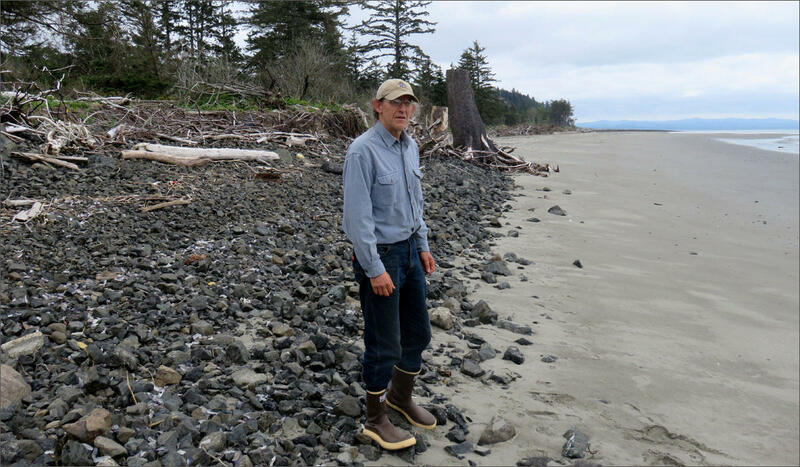 Pacific Conservation District Manager Mike Nordin said an erosion control grant application seeking slightly more than $600,000 is pending with the Washington State Conservation Commission. "This for bang for the buck is pretty impressive," Nordin said in an interview Tuesday. 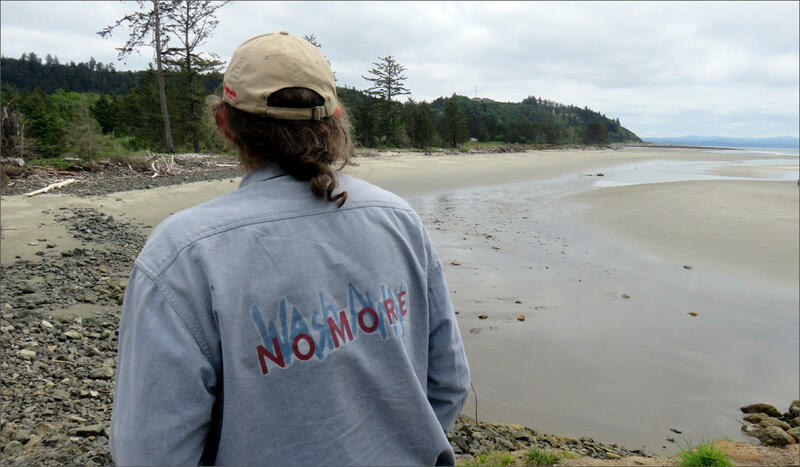 David Cottrell models a shirt with a slogan that represents local hopes to retire the moniker Washaway Beach. Cottrell compared the functionality of dynamic revetment to a runaway truck ramp on a mountain highway. "If you've got a truck coming down a mountain at 100 mph, you can stop it with a rock wall, but it's going to be ugly and pieces are going to go flying all over the place," Cottrell said. "That's the way the way waves hitting these vertical banks behave." "That's kind of what we hope these waves do,” Cottrell added. “They come up gradually and they roll back gradually like you see on a long, flat beach, rather than come up and have an ugly collision that just keeps driving the erosion." A potential long term fix recently won initial funding from the Washington Legislature. State Rep. Brian Blake secured $650,000 for Pacific County to do technical and environmental analysis, engineering and permit preparation for erosion control structures. Those could include shoreline revetment, groin structures and beach nourishment. A top goal of the state grant is to protect a particularly endangered stretch of Washington SR 105 and an underlying tide gate. The highway and gate serve as the main line of defense against saltwater encroachment into hundreds of acres of low-lying cranberry bogs, including more than 50 acres farmed by Cottrell. In 2016, we photographed this abandoned home perched precariously on the bank and predicted it would probably be the next to fall. In May 2018, it's mostly still there. 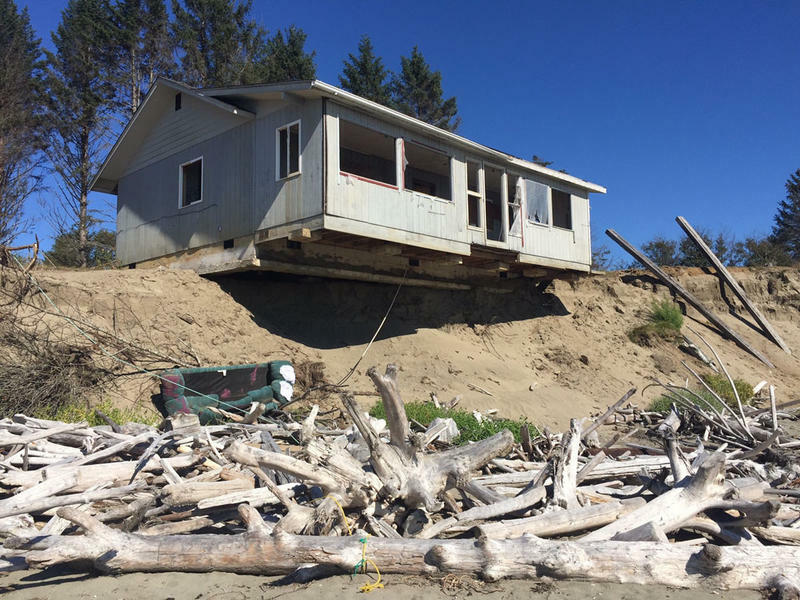 The Washington state Department of Ecology says the fastest erosion on the West Coast is happening at aptly named Washaway Beach -- located between the southwest Washington towns of Grayland and Tokeland. Most places threatened by erosion try to fight back. But the erosion at Washaway Beach is so rapid, the question now is to fight -- or retreat.